The Favorites is a series briefly exploring films I love, to find out what makes them - and me - tick. My Night at Maud's (1969/France/dir. Eric Rohmer) appeared at #23 on my original list. What it is • In the ancient, quiet town of Clermont-Ferrand, Jean-Louis (Jean-Louis Trintagnent), a Catholic convert, meets up with an old friend, Vidal (Antoine Vitez), a Marxist. Contesting the claims of faith, they are particularly captivated by the dilemma of Pascal's wager: the idea that one should choose the less likely but more rewarding prospect. Shortly afterward, Vidal introduces Jean-Louis to a charming divorcee, Maud (Francoise Fabian). 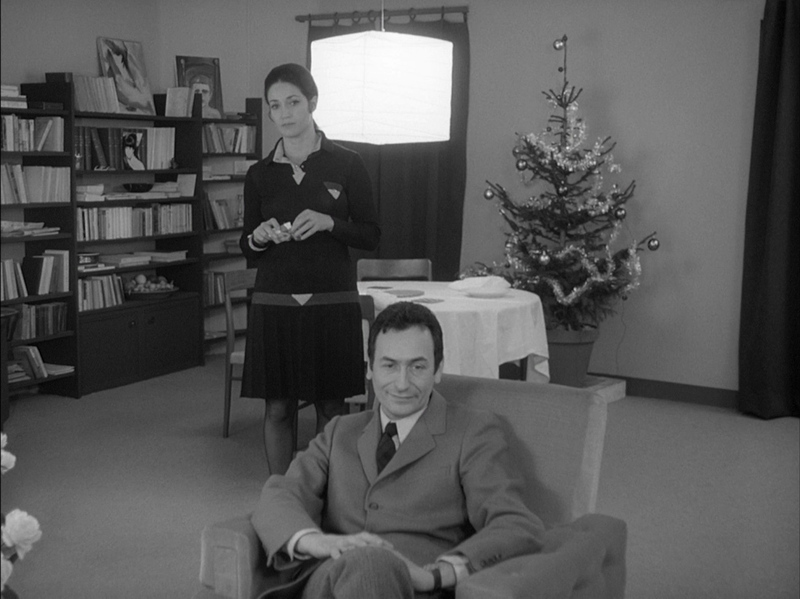 The long conversation which unfolds in her apartment, as she invites Jean-Louis to spend the night - platonically or otherwise - is at once a protracted intellectual version of "Baby, It's Cold Outside" with the gender roles reversed (as I think CriterionCast pointed out) and a test of the philosophical question Jean-Louis and Vidal debated earlier in the film. Jean-Louis has already committed himself, mentally anyway, to Francoise (Marie-Christine Barrault), a pretty blonde whom he has never met but whom he fell in love with while observing her at Mass. Is she the one he is wagering everything on, sacrificing short-term happiness with Maud for an idealized marriage with her? Or is the other way around; is he going for the safe bet with this quiet, good Catholic girl (or so he believes) and missing out on a riskier but possibly more deeply enriching relationship with Maud? The film holds many ambiguities and conceals several tricks up its sleeve, but despite the cleverness of its overall shape and its fearlessness in articulating every concern (My Night at Maud's has long been synonymous with "talky film") this is also very much an exercise in atmosphere. Like all of Rohmer's Six Moral Tales - this was titled as the third, but released as the fourth - the film is gorgeously shot (in this case and several others by Nestor Almendros) and makes beautiful use of its evocative location. The Moral Tales may be aggressively verbal, but they are also luminously visual. There's something very comfortable and cozy about My Night at Maud's. The wintry exterior, the warm interior, Fabian's attractive charisma, even her big fluffy comforter contribute to this sensation, as does the absorbing patter of the night's discussions. But there is also an edge to this comfort, perhaps because of the tension between the (potential) couple's values, perhaps because of the light but somber touch of severity in Trintignant, his character's Catholicism, and the provincial isolation he has chosen for himself, perhaps even because of the energy of the times themselves spilling into the frame despite its separation in space and theme from the excitement of 1968. I find this combination of comfort and tension irresistible. My Night at Maud's also - as is often the case - locates a certain sexiness in desire that can be trickier to depict in fulfillment. And of course, it's genuinely thought-provoking although I've observed that the film's particular arguments, questions, and conclusions, as much as they captivate while watching/listening, are often hard for me to remember afterwards. The mood, on the other hand, lingers long after I've lost the words. Recently I revisited part of the film, and was surprised by how much I had not only obscured, but remembered incorrectly. Later, a discussion reminded me of the film's biggest, brilliant twist which I had completely forgotten. In that sense Maud's is a bit like Maud herself - a deep connection is forged even when it turns out you don't know it, or her, as well as you thought you did. A stranger and a familiar at the same time...a dual quality Rohmer would no doubt appreciate. More from me • I saw My Night at Maud's for the first time ten years ago and left this comment on IMDb (later re-printed on this site). A clip appears at 1:38 in "Shadow of '68", a chapter in my video clip series "32 Days of Movies". How you can see it • My Night at Maud's streams on Hulu and is available on DVD from Netflix. What do you think? • Is this the best and/or your favorite Moral Tale (and are the Moral Tales your favorite Rohmers)? Which other Rohmer films does this remind you of, and how does it differ from them? Of the many films it influenced, or at the very least strongly resembles, which ones best capture the quality of a fleeting but memorable encounter?